“Flights have now resumed. Airfield movements were suspended while we investigated this as safety remains our main priority,” the airport said in a statement. A combined police-military operation codenamed Operation Trebor was underway at and around the airport throughout Friday. Dozens upon dozens of flights were inbound to Gatwick at the time of the closure, with many diverting to alternate airports or even returning to their points of origin. Criticism of the amount and timeliness of information from official sources continued, given that flight tracking websites were providing substantially more information, and at a more granular level, to passengers than most airlines or other official channels. FlightRadar24, for example, highlighted the number of airlines of all stripes with aircraft inbound to Gatwick at the time of the shutdown. Runway at Gatwick Airport is closed again. Earlier in the evening UK time, European air traffic control authority Eurocontrol noted in updates to pilots that arrivals were “slowly improving with an increased acceptance rate”, later updated to note that “another drone [was] sighted resulting in a 0-rate initially until 2100 UTC”, with “high delays”. Communication through official channels has been less than ideal, with updates reaching social media of passengers noting their aircraft were being held on runways well in advance of official statements from the airport or air traffic control, let alone any government point of contact. Indeed, the government response was roundly criticised both within and outside the UK, and the message outside the aviation community is largely asking questions about why governments do not have a more robust plan than simply shutting a major airport in the event of malicious drone activity. Investigations into the identity of the drone operator — or operators, which continues to be the prevailing theory — have as yet not achieved results. Many within the aviation community have highlighted how much disruption has been caused simply by drone operators seemingly wishing to interfere with normal airport operations rather than actively approaching or attempting to intercept aircraft. “I cannot guarantee that another drone isn’t going to pop up and disrupt the airport,” Barry said, before the Friday night drone event. “The situation is being kept under review but we are in a much more positive situation than yesterday. The runway is open and we hope to keep it that way. We are working very closely with Gatwick Airport Limited and the Civil Aviation Authority and are in close consultation with the government and other agencies in an effort to keep people safe. “We have significantly increased our police presence to support the operation,” Barry noted. In a rather eyewatering coincidence, the UK Department for Transport published on Thursday its “Showcase of ‘Future of Aviation Security’ Innovations”. Secretary of state for transport Chris Grayling lifted restrictions on nighttime operations to other UK airports on Thursday and into Friday in order to enable schedule recovery efforts after the Thursday reopening of Gatwick, and indeed a substantial portion of the airport’s daily schedule was able to be operated on Friday prior to the appearance once more of drones over the airport. These recovery efforts are complicated by the nature of traffic to and from Gatwick. 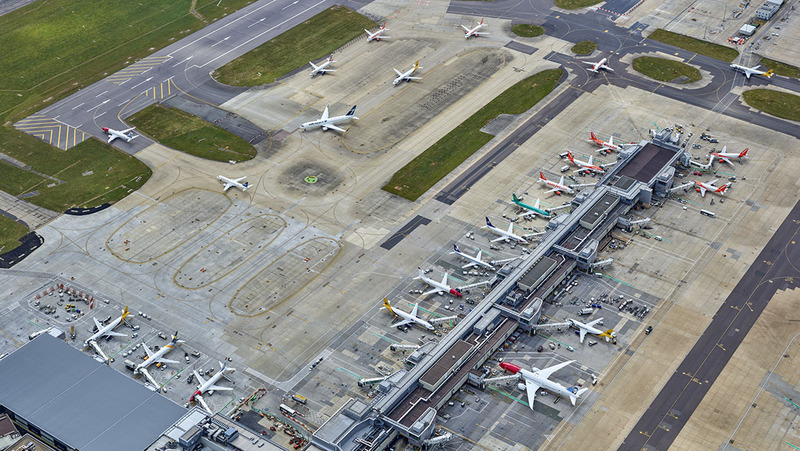 It’s not just the short-haul network for which Gatwick is renowned, and which makes up the majority of traffic from Britain’s second airport. It’s the origin-and-destination traffic from a substantial part of the world, and especially for those airlines whose budget may not stretch to acquiring a gold-dust-like London Heathrow slot, but that wish to serve diaspora communities and connecting traffic nonetheless. Carriers like Rwandair, for example, have few contingency options in the event of disruption. Earlier in the day, the airport was keen to emphasise the measures put in place. “Overnight we have been able to work with partners, including Government agencies and the Military to put measures in place which have provided the confidence we needed to re-open the runway and ensure the safety of passengers, which remains our priority,” it said in a statement. “On behalf of everyone at Gatwick I would like to repeat how sorry we are for the inconvenience this criminal behaviour has caused passengers and we share their real anger and frustration that it has happened,” said chief executive officer Stewart Wingate. “We hope passengers appreciate that we must and will always prioritise their safety over everything else. We are all working flat out to minimise inconvenience and have additional staff in both terminals assisting passengers who are waiting,” Wingate said.